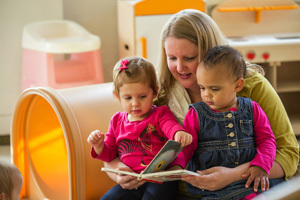 Founded in 2001, HB's Infant & Toddler Center serves infant and toddler-age children of Hathaway Brown employees as well as current families, children of alumnae and families new to the HB community from 8 weeks old through 2 years old. The Center provides care for infants, young toddlers and older toddlers. Our small size allows for low teacher to student ratios significantly above state standards, 2:1 for infants, 3:1 for young toddlers and 4:1 for older toddlers. Open daily 7:30 am-6:00 pm from mid-August through mid-June and an optional summer program. Numerous opportunities to explore the entire HB campus - indoors and outdoors-from listening to the orchestra play in the Jewet-Brown Academic Center, watching water polo practice in the Butler Aquatic Center to taking walks through the Courtland Woods. Our gymnasium, large muscle room, outdoor grass and paved area and Mixon playground allow for growth in physical development. 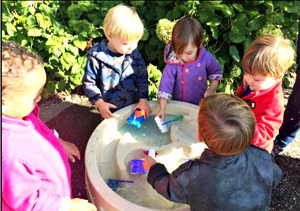 Practice of receptive and expressive language, motor skills, cognitive skills, and social skills with experienced and trained teachers. Trips to the vegetable garden and walks through the Oliva herb garden give children the chance to explore with their senses. A strong community: our Upper School students both work and volunteer in the Center daily. To learn more or to see it in action, please call our Admission Office at 216.320.8767.